The bill applies to the places where a person may carry a handgun if they hold a LTC as well as addresses certain related criminal offenses. It makes all government property open to gun owners, the author says. It also opens up hospitals and amusement parks to LTC holders. The bill would not change a private property owner’s right to prohibit a licensed holder from entering the property upon proper legal notice as defined in section 30.06. 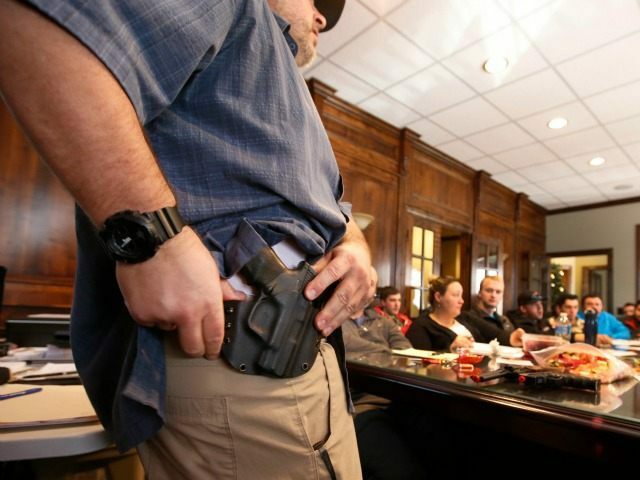 Rep. Springer told Breitbart Texas that licensed holders are substantially less likely to use guns or commit a crime. He also said he believes that it is “crazy” for a hospital to prohibit the lawful carrying by a licensed holder when there are no metal detectors at the facility. The bill also adds to the 30.06 offense provision that relates to a school or educational institution, specifically the phrase “‘the portion of’ any grounds or building on which an activity sponsored by a school or educational institution is being conducted.” It does the same for the provision relating to the premises of an institution of higher education. It clarifies that the prohibition against carrying a firearm or prohibited weapon on the physical premises of a school or educational institution, including an institution of higher education, only applies to the part of (“portion of“) the grounds or building on which an activity sponsored by the school or educational institution is being conducted. Instead of restricting LTC holders on “the premises of a polling place,” it adds the phrase “the portion of” to restrict gun prohibitions to the actual portion of a building being used as a polling facility. A privately owned facility could still restrict a LTC holder from carrying. The bill pre-filed by Rep. Springer also lowers the offense of open carrying without a belt or shoulder holster from a Class A misdemeanor to a Class C misdemeanor. This is the third session that the Republican legislator has filed the bill.